History may remember the British Empire as having been the most powerful at some point. But little attention may be directed to the odds that were involved in maintaining such global power. It’s not the easiest position to keep. Britain had one key advantage over the rest of the world, though – better military technology. The Victorian army was one of the most experienced and best equipped on the planet. It waged several successful battles against forces native to South Pacific, North and South of Africa, as well as West and East of the continent. None of these conquests was a walk in the park, though. Every one of the opponents the British army faced was wildly different from the other. With each group presenting a different tactical approach, skillset, and weaponry, it took quite some quick adapting to earn the victories. The British war against the Zulus is conceivably the most legendary of its conquests in Africa. This local empire was guarded by one of Africa’s most aggressive and toughest native armies- the impis. The impis could run for several miles before launching an attack on their enemies whom they would overwhelm with their short piercing spears. Perhaps the most outstanding element behind the Zulu power was their discipline. This enabled them to launch a coordinated maneuver swiftly upon command. With that, they would coherently throw themselves against their adversaries in waves that would often outmaneuver the enemy. Britain wanted to unite the Southern Africa territories under a common leadership. This would be impossible without conquering the Zulus. They issued them with an ultimatum. And as expected, the natives did not take it kindly. War soon broke with Britain’s invasion of the lands of the Zulu. Zulus were initially triumphant over the British forces at Isandlwana. This was followed by a desperate combat popularly known today as the Battle of Rorke’s Drift. 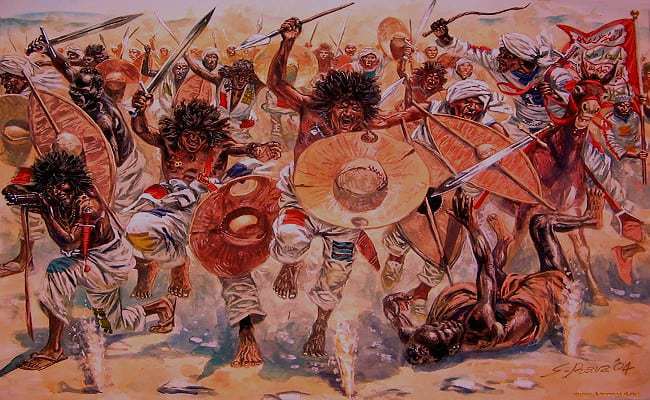 150 British and colonial troops battled off about 4,000 Zulu warriors. Regardless of their numbers, the power of the modern guns gave the British their triumph by the last Battle of Ulundi. There were lots of casualties. Over and above, the colonialists learned a strong lesson from the events – they would never again underestimate an opponent on the grounds of technological inferiority.